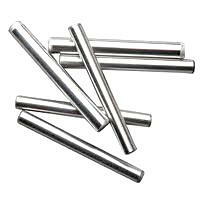 Our stainless steel dowel pins are manufactured from 18-8 series stainless steel, a non-magnetic material with strength and corrosion resistance that is comparable to standard steel. These pins meet ASME B18.8.2 material specifications. Stainless steel dowel pins are a common choice of industry professionals—the robust nature of the material allows these pins to be used for longer time periods without failing. Due to their resiliency, stainless steel dowel pins are often used for part alignment applications in the research, medical, and automotive industries. If your specific application requires dowel pins are not listed here, contact us and let us know your requirements. With over 60 years of manufacturing experience, our team is more than capable of producing custom dowel pins to suit your precise needs. Our custom services are unrivaled—you can rely on us for the highest-quality dowel pins. Browse the Suburban Industries Catalog to see the exact product dimensions of our stainless steel dowel pins. If you are unsure of which dowel pin to choose, just ask one of our representatives for help—we can help you make the most ideal decision based on your application.